On Wednesday, September 27, the Financial Times (FT) published its third edition of the FT 401 Top Retirement Advisors, which included advisors from 38 states. 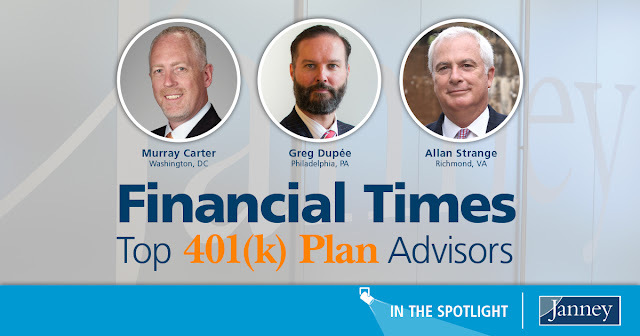 Janney’s Murray Carter, Executive Vice President / Wealth Management, Washington, DC; Gregory J. Dupée, Senior Vice President / Wealth Management, Philadelphia, PA; and Allan H. Strange, Executive Vice President / Investments, Richmond, VA were included as part of this prestigious group. According to the FT, the average advisor on the list has 19 years of experience advising defined-contribution (DC) plans and manages $1.6 billion in DC plan assets. Murray Carter, AWMA®, CFP®, AIF®, Accredited Wealth Management AdvisorSM, Certified 401(k) Professional, and Accredited Investment Fiduciary™, has over two decades of experience in the financial services industry. His team, CSG Capital Partners, has two main business focuses – successfully managing retail wealth and retirement plans. This is the second time that Carter is included in the FT’s list. His first inclusion was in 2015. Carter credits his success with his 401(k) retirement planning to providing superior service to clients in comparison to other firms. “We are here to work with clients, to stay in touch, and to provide them with the education and support they need. With our team, clients don’t need to worry about reaching out to us. We are proactive and offer helpful advice,” he said. As an industry leader and a member of The National Association of Plan Advisors (NAPA), an affiliate organization of the American Retirement Association that was created by and for retirement plan advisors, Carter has participated in the DC Fly-In Forum and has lobbied on Capitol Hill, advocating to protect clients’ rights. Gregory J. Dupée, AIF®, was awarded this honor for the second year, after being included on the list for the first time in 2016. Dupée joined Janney two years ago and has nearly 30 years’ experience in the financial services industry. At Janney, Dupée oversees a group of four who conduct a broad mix of institutional-level research for clients in the not-for-profit, corporate, and high-net-worth private client segments. Currently, his group manages $700m in institutional and private client assets, and oversees the wealth management of more than 125 families. Allan H. Strange, AIF®, has been advising clients on their investments for nearly 40 years, and joined Janney in 2009. For the past eight years, Strange has participated in Janney’s CEO Roundtable and was honored as Janney’s Financial Advisor of the Year in 2015. This year marks the third time that Strange was part of the FT’s Top 401 list, also earning the recognition in 2015 and 2016. The FT and Ignites Research utilized information gathered from large U.S. brokerages, independent advisors, and other wealth managers to identify qualified applicants who were required to advise at least $50m in DC assets and have at least 20% of their client assets in DC plans. The formula that the FT used to grade and select advisers was based on seven factors: DC assets under management, specialization in the DC business, growth rate in DC plan business measured by changes in both DC plan clients and assets, years of experience advising DC plans, industry certifications, participation rate in DC plans advised, and compliance record.